Picture taken from The Royal Jewels of the World Message Board. Please let me know if this picture is yours and info about this event so I may give credit. Picture taken from The Royal Jewels of the World Message Board. This hi-res photo was originally on a Diana Exhibit website in Houston or Florida. If this is yours, please let me know so I may give credit. From the caption in the souvenir book of 'Diana: a celebration' p.16 which I saw in Dayton, Ohio in April 2006. "...Every single diamond is detachable and a bracelet can be made from part of it. Hanging from the necklace are 3 pearls in diamond mounts and drops from a pair of diamond earrings." 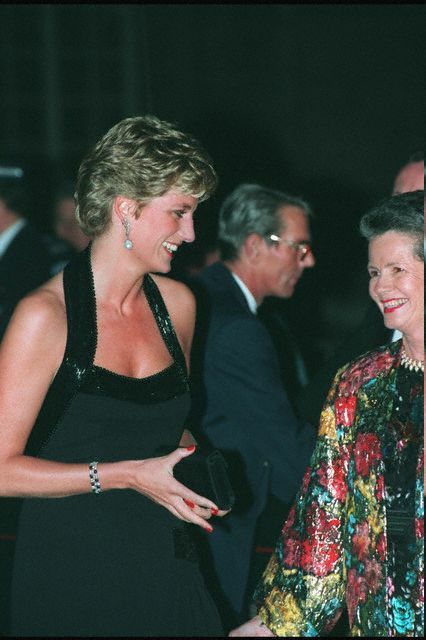 Both the necklace and earrings were borrowed from Diana's mother for this event. I am trying to locate the source of information about the necklace. 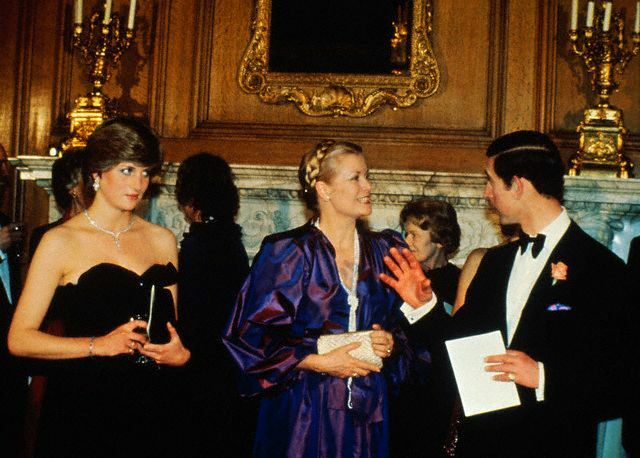 Original caption: London, England: Prince Charles and Lady Diana Spencer with Princess Grace of Monaco in the Goldsmiths' Hall, City of London, for money-raising concert and reception in aid of the Royal Opera House, Covent Garden. March 9, 1981. 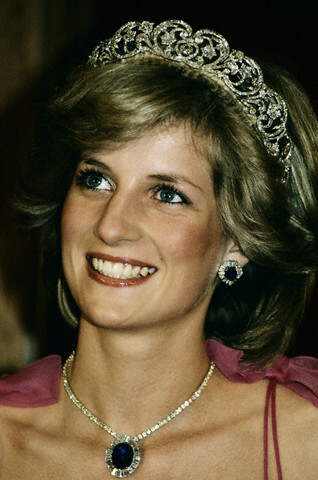 The diamond earrings and necklace were on loan from Collingwood jewelers, which were the jewelers favored by the Spencer Family ever since Lady Diana was a girl. The jewelries were borrowed for the official engagement photographs taken by Lord Snowdon at Highgrove House. Collingwood had wanted to give this set to Diana as a wedding present but it was deemed inappropriate by Palace officials. 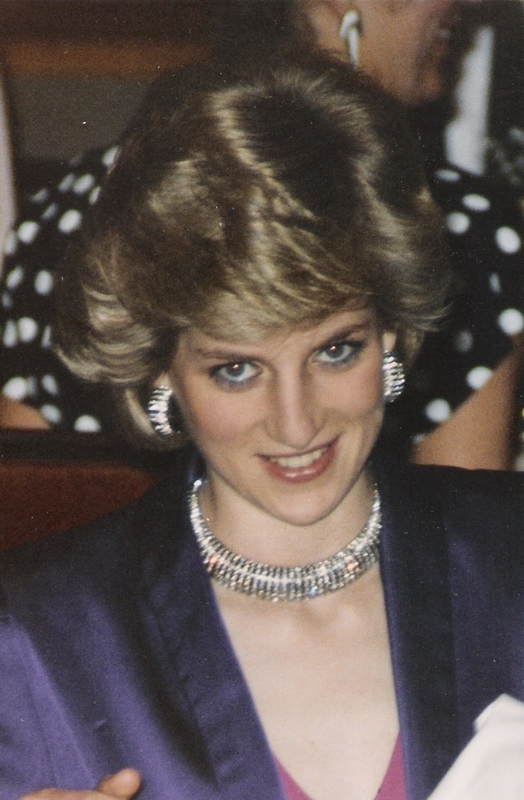 Collingwood did present Diana with a diamond and pearl earrings. 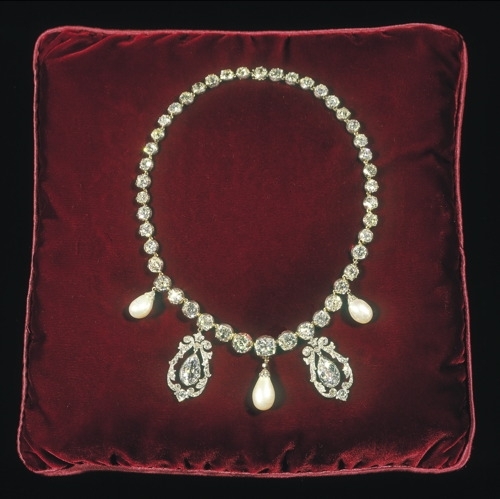 The necklace and earrings were sold by an Iranian jeweler in Dusseldorf, Genio Hakimi, who claimed they were Spencer heirlooms that had been sold to pay for the wedding (The Queen's Jewels p.36, Leslie Field). He used these photographs as proof. I sometimes I wonder who owns this set. 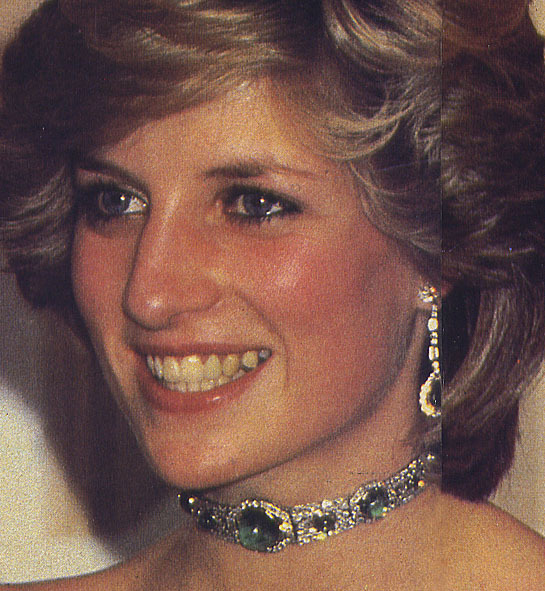 Lady Diana wore this necklace again during the visit of King Khalid of Saudi Arabia in June 10, 1981. Picture taken from The Royal Jewels of the World Message Board. If this came from you, please let me know so I may give credit. Picture from The Royal Jewels of the World Message Board. If this was yours, please let me know so I may give credit. This necklace was made by Harry Winston and was given to QEII when she made a State visit to Saudi Arabia in February 1979. The Queen loaned it to the Princess on at least three occasions during 1982 and 1983 (The Queen's Jewels p.57, Leslie Field). 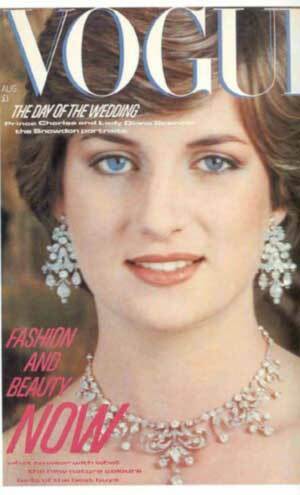 Diana wears it with the diamond and pearl drop earrings, a wedding present from the Emir of Qatar. 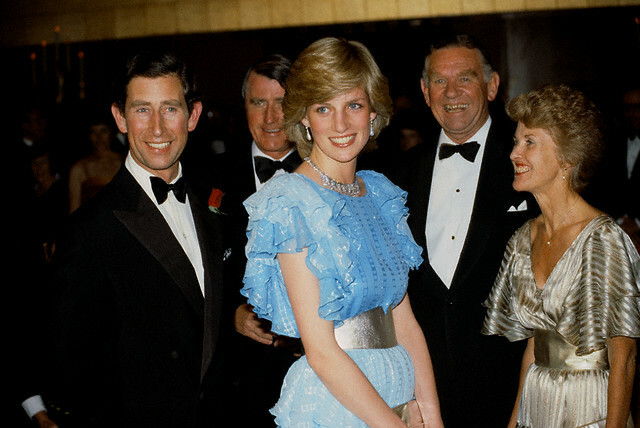 Prince Charles wears a black tuxedo and Princess Diana wears a light blue gown to a gala evening during a visit to Australia. Diamond collar necklace with matching earrings. Unfortunately, I have no information on this event. 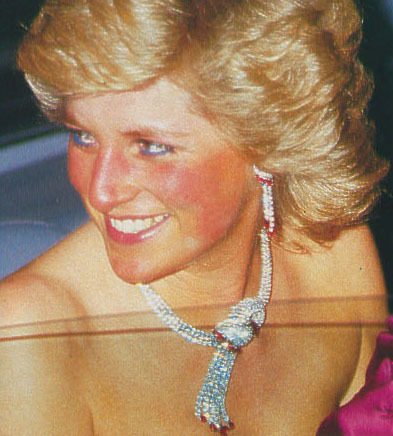 This is the only picture of Diana wearing this particular necklace. Picture copied from The Royal Jewels of the World Message Board. If this is your photo, please let me know so I may give you credit. Thanks. 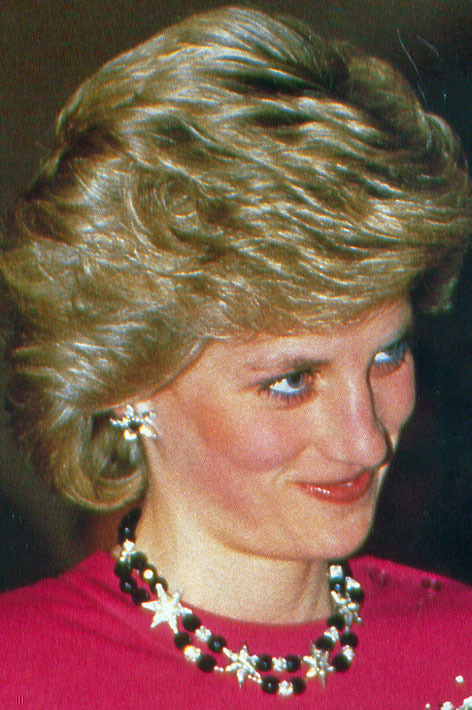 This crescent-shaped diamond earrings were given to Diana by the Sultan of Oman during the royal couple's visit to Oman in November 1986 (Dressing Diana p.99, Tim Graham and Tamsin Blanchard). It is part of suite of diamond necklace and earrings seen in this photo and a diamond bracelet (not shown). 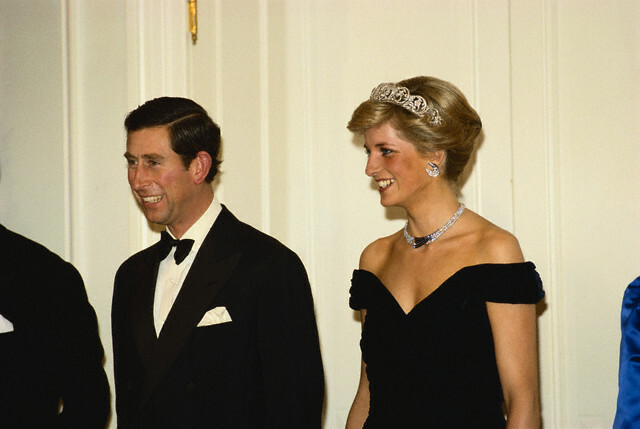 Prince Charles and Princess Diana attend a formal banquet while on a visit to Germany. 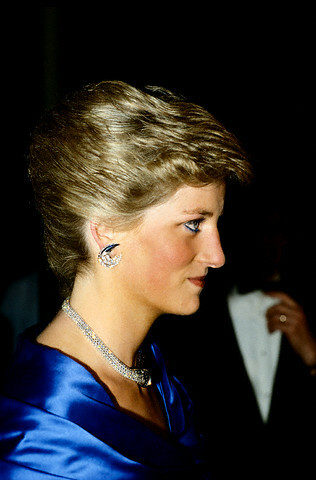 Profile of Princess Diana in blue satin evening gown. 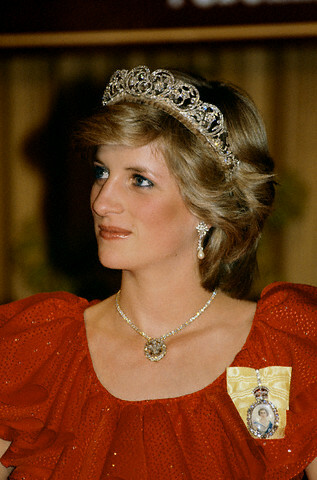 For her wedding present, the Crown Prince of Saudi Arabia gave the Princess a magnificent suite of jewelry as shown in picture below: a sapphire and diamond pendant suspended on a diamond tennis necklace (which also suspends 'The Prince of Wales feathers diamond pendant'), matching earrings, matching ring, a bracelet and a watch. This was made by Asprey.
" 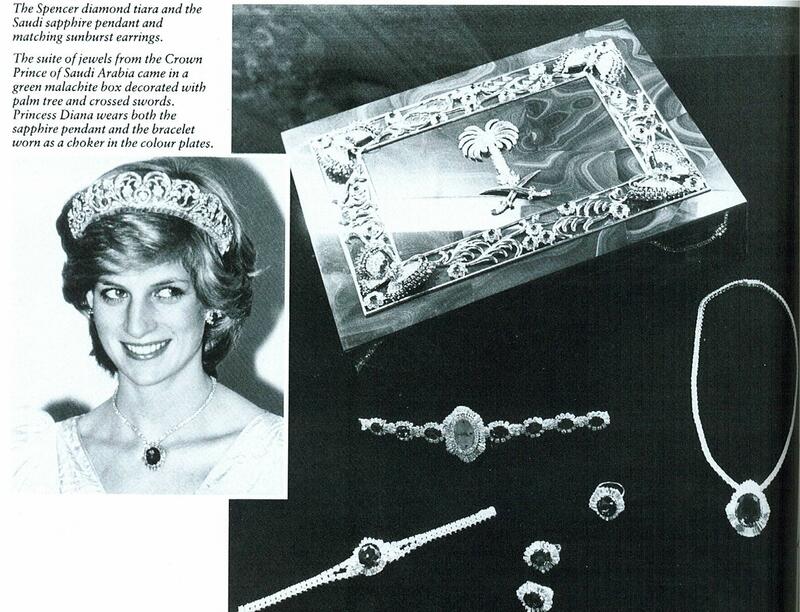 The Princess of Wales's most magnificent wedding gift was a sapphire and diamond suite from the Crown Prince of Saudi Arabia. Made by Asprey, it consists of an enormous Burmese sapphire pendant set in a jagged sunray fringe of baguette diamonds and hung on a thin diamond necklace; a matching pair of earrings and ring; a two-row bracelet of brilliant-cut diamonds with a smaller version of the sapphire pendant as a centrepiece; and a wristwatch, the face set in the same diamond sunray fringe and the strap consisting of seven oval sapphires set in clusters of diamonds...."
" The Princess often wears the necklace and earrings, and occasionally the bracelet, but she has used the stones from the watch and ring to make completely new pieces of jewellery. Four of the sapphire and diamond clusters from the watch strap were made into a pair of earrings, with two of the clusters as detachable pendant drops. The oval sapphire from the ring was set in the diamond sunray frame of the watch and is now the centrepiece of a wide choker of midnight-blue velvet backed with Velcro. On either side of the sapphire is a chain of small diamonds, three deep, which runs halfway round the choker. The Princess wore the choker as a headband on her official visit to Japin in 1986, at a State banquet hosted by the Emperor." 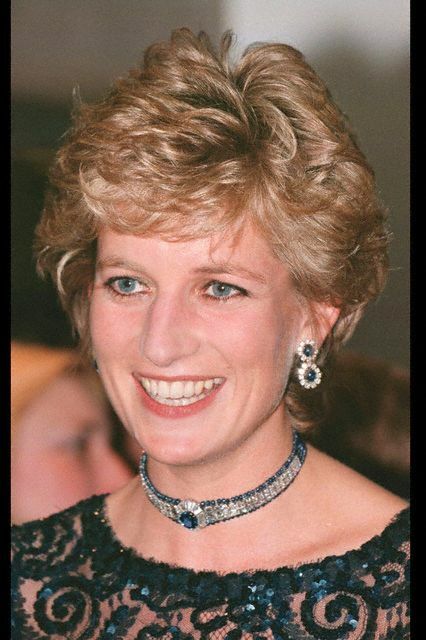 Diana, Princess of Wales wearing the diamond and sapphire choker on a midnight-blue velvet backed with Velcro. 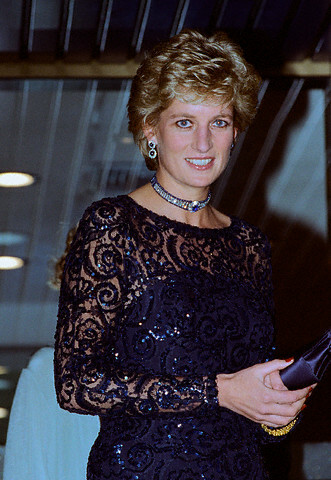 Princess Diana attends a formal event in a dark blue velvet and lace dress. This choker is different from the one above. The diamonds surrounding the central sapphire is larger and the diamond links appear to be wider than the one above. 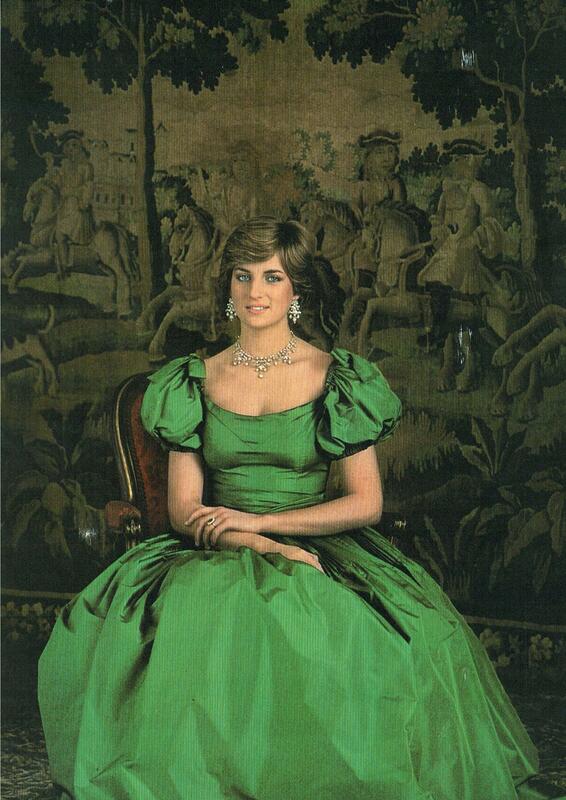 Original caption: Portrait of the Princess of Wales. This large diamond and sapphire pendant is detachable from the diamond tennis necklace. 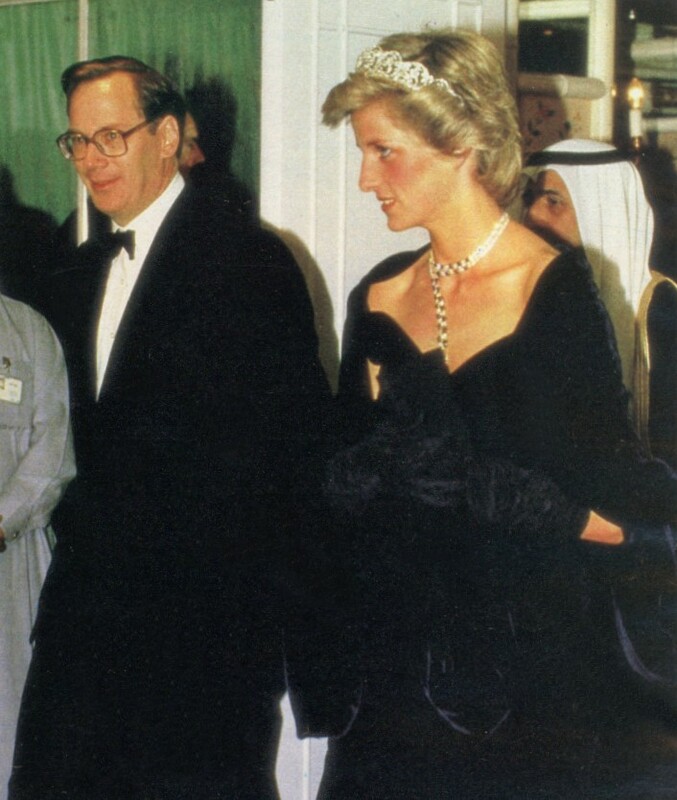 Princess Diana wears a suite of sapphire and diamond jewels presented by the Crown Prince of Saudi Arabia, and the Spencer family tiara. 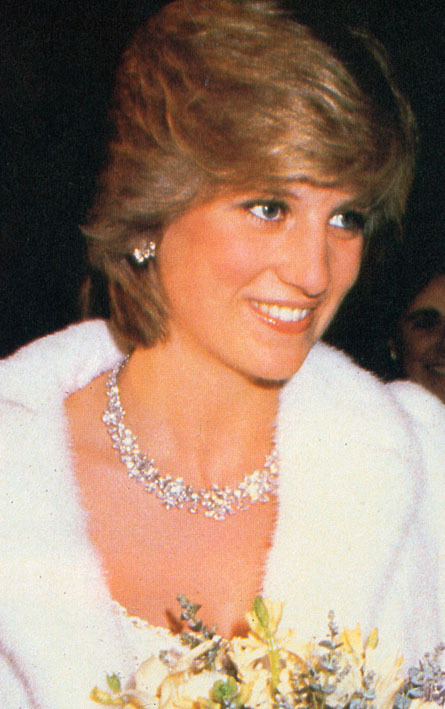 The only diamond necklace that the Princess of Wales owns is the solid chain of brilliant-cut diamonds set in gold that part of the sapphire and diamond suite she received as a wedding gift from the Crown Prince of Saudi Arabia. Its large sapphire pendant is detachable and the Princess also wears the chain with the diamond Prince of Wales feathers' pendant that Queen Elizabeth the Queen Mother gave her just after her engagement was announced. 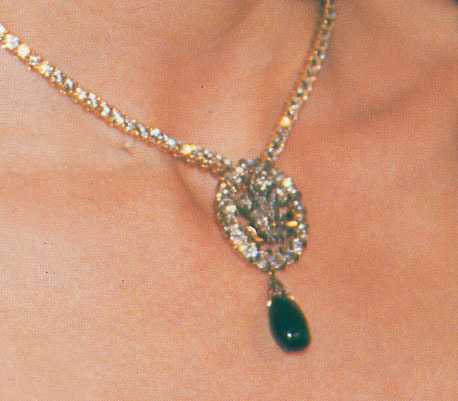 This oval pendant, which has a detachable emerald drop, had been a wedding gift to Princess Alexandra of Denmark from the 'Ladies of Bristol' when she married the future King Edward VII in 1863...."
Princess Diana wears the Prince of Wales Feathers necklace at the Royal Opera House. 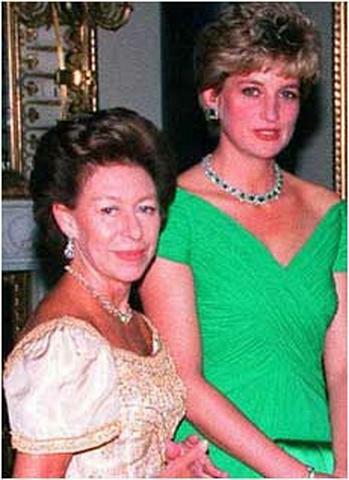 "...Diana added the cabochon emerald drop to her diamond Prince of Wales feather pendant, recalling the style of Princess Alexandra..."
Picture from The Royal Jewels of the World Message Board. If this came from you, please let me know so credit can be given. This Art Deco choker was a wedding gift from the Queen. Picture spliced together from website link below. The original idea came from The Royal Jewels of the World Message Board which I re-did since I wanted a larger photo. "Originally made with sixteen of the Cambridge emeralds as part of the Delhi Durbar parure, matching the necklace and bracelet, it was remodelled for Queen Mary in the 1920s using the same emeralds and brilliant-cut diamonds, but set in platinum in the Art Deco style. Inherited by The Queen in 1953, it was later worn by The Princess of Wales." 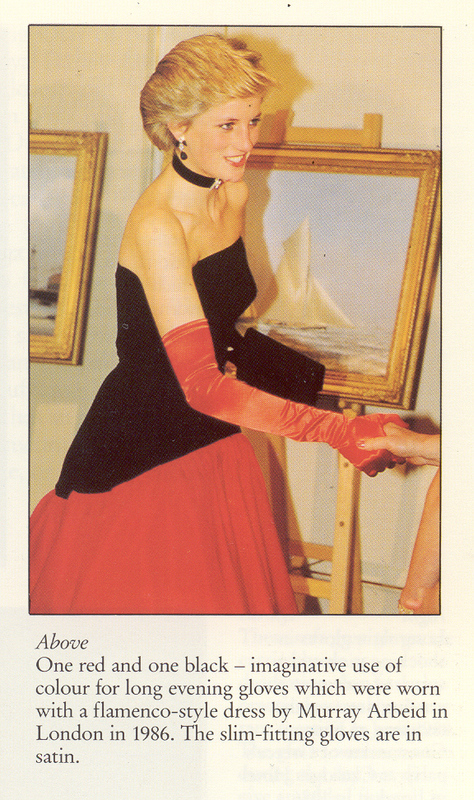 Pictures scanned from 'Debrett's Illustrated Fashion Guid, The Princess of Wales' by Jayne and Terry Finger. Thanks to VeronikaN for providing these photos! The Prince and Princess of Wales return from their honeymoon to the Royal Air Force base at Lossiemouth. 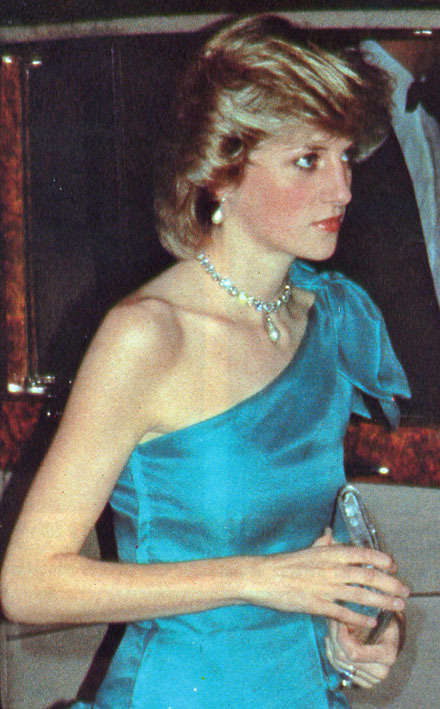 Princess Diana attends a formal event in a strapless blue dress and matching gloves. The sapphire and diamond part of this necklace breaks up into two pairs of sapphire cabochon and diamond bracelets. The Princess of Wales wore this to a State Banquet the day after she arrived from her USA visit in November 1985 wearing the 'Travolta dress', the gown she wore at The White House where she danced with John Travolta. 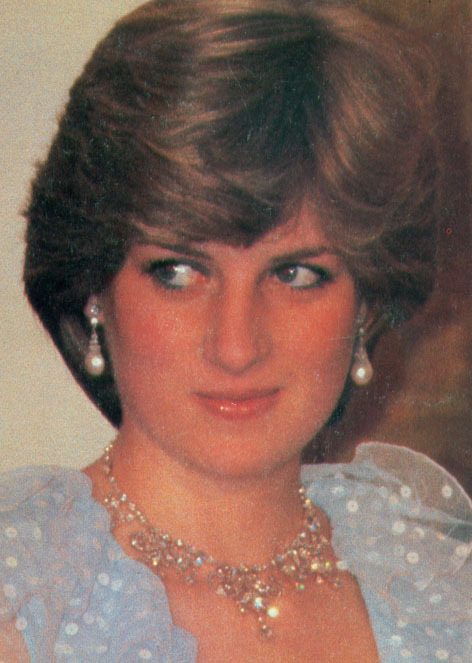 Photos of Diana wearing this necklace are extremely rare and I am indebted to Squidgy from The Royal Forums Message Board who provided me with one and for Boris from The Royal Jewels Message Board who brought it to my attention. 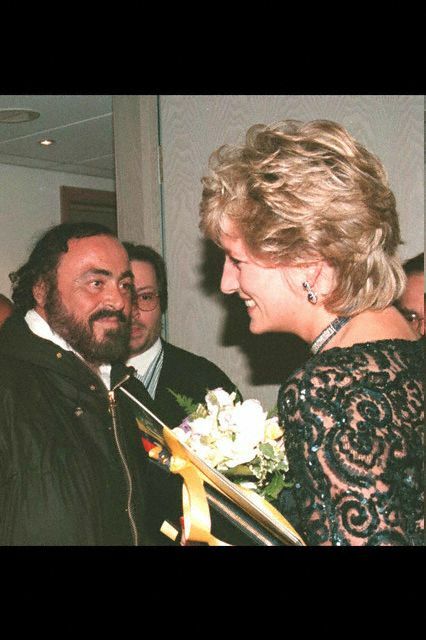 Picture from Squidgy, The Royal Forums Message Board, Diana, Princess of Wales Picture Thread Part IV. Originally scanned from HOLA magazine. Picture from MClark's scrapbook sent via e-mail. Original newspaper and photographer unknown. The flower pendant looks like a diamond center stone with sapphire cabochon or onyx petals. 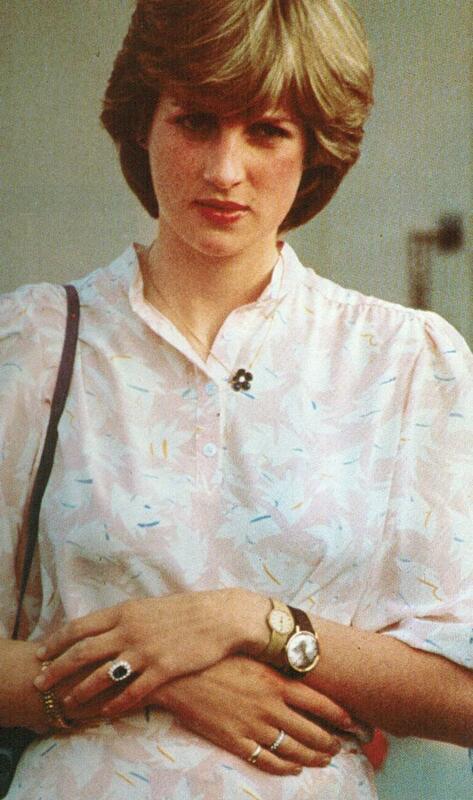 This was taken while Diana was watching Charles playing polo July 26, 1981. She's wearing his watch.